I'm sure everyone has heard that the IRS is not going to be mailing 2010 tax forms to peoples' homes next year. I don't blame them for looking for ways to save money, and it's good to be moving towards more efficient processes. But this isn't exactly a gentle nudge - this is a sharp push, which will be especially painful to people without internet access or few computer skills. options to taxpayers, as well as to help reduce costs. Although tax products are available online at IRS.gov and IRS Taxpayer Assistance Centers (TACs), you may experience an increase in patrons visiting your location for tax products. The IRS mailed postcards to individuals who filed paper returns last year and did not use a tax preparer or tax software. 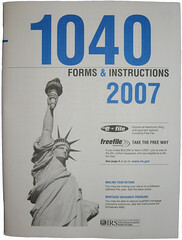 The postcard provides information on how to get the tax forms and instructions they need for filing their tax year 2010 return. Your TFOP order form lists the most commonly used tax products. Use the order form to order additional stock of any of these products, if necessary. Your order form lists Publication 1132, /Reproducible Copies of Federal Tax Forms and Instructions/ and Publication 3194, /Reproducible Copies of Federal Tax Forms /- Laminated Version. These publications contain the most commonly used tax products that, if available, can be photocopied by your patrons. Tax products will become available beginning January 2011. I think "you may see an increase in patrons" is a bit of an understatement. Those who prefer hardcopy documents can still find them at libraries, post offices and walk-in IRS offices around the country. After Jan. 1, they can request a mailing through the IRS toll-free number, 800-829-3676. Yes, it should be a fun one this year. Every year, public libraries (and, I'm sure, post offices, town halls, senior centers, and other public places) have the pleasure of being a distribution point for Federal and State tax forms. 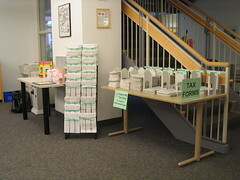 This year at my library, I'm trying something new with our tax form display. In years past, the tax forms were kept on empty bookshelves about as far away from the front door as you could get. This was messy and needlessly complicated. This year, I bought a stand to hold the forms, set up a couple tables for the instruction booklets, and put everything right at the base of the stairs in the reference area (see photo). This is about 100 feet closer to the front door - and about as close as I can get while still being within range of the reference desk, so we can help people when they have questions. A small triumph.